English comic actor, writer and film director Stan Laurel was born 16 June 1890 he is most famous for his role in the comedy duo Laurel and Hardy. 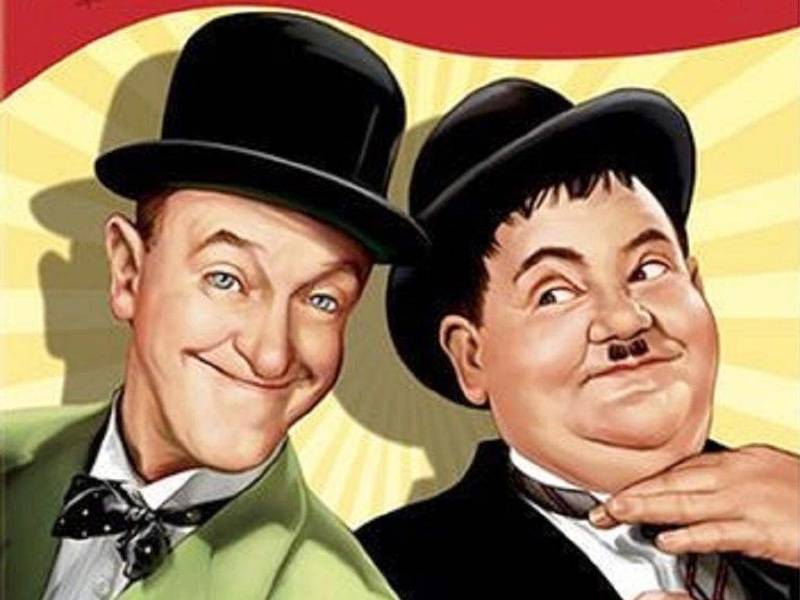 With his comedy partner Oliver Hardy he appeared in 107 short films, feature films and cameo roles. Laurel began his career in the British music hall, from where he took a number of his standard comic devices: the bowler hat, the deep comic gravity, and the nonsensical understatement. His performances polished his skills at pantomime and music hall sketches. Laurel was a member of “Fred Karno’s Army,” where he was Charlie Chaplin’s understudy.The two arrived in the US on the same ship from Britain with the Karno troupe. Laurel went into films in the US, with his acting career stretching between 1917 and 1951, and from “silents” to “talkies.” It included a starring role in the film The Music Box (1932). 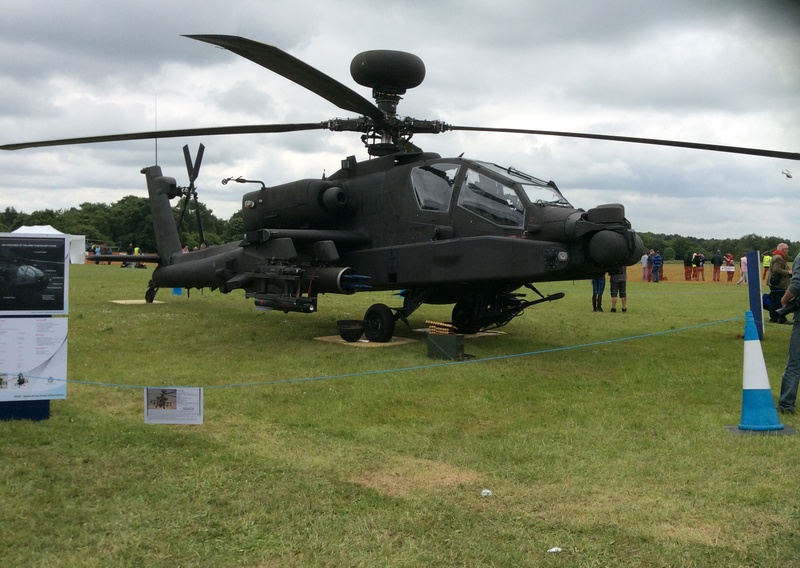 I went to This years RAF Cosford Air Show on Sunday 14 June 2015. This year to celebrate the 70th Anniversary of Victory in Europe Day the Show featured a Victory Village Which recreated the atmosphere of street parties that were held throughout Britain at the end Of World War II .Wing Commander Kevin Rayner, the show’s chairman, said that “Visitors will feel like they are back in 1945 when the war was won.” There was also live music from the time, as well veterans on hand to talk to visitors about their experiences. Television host Carol Vorderman also payed a visit to Cosford Air show in her capacity as Group Captain and Ambassador of the Air Cadets. Aeriel displays at the show included a Gloster Meteor, Westland Sea King Helicopter HAR3 rescue display, the Breitling Wing Walkers, Mirage 2000m Ramex Delta,The Battle of Britain Memorial Flight Hawker Hurricane, Supermarine Spitfire and Douglas C-47 Dakota, The Red Arrows aerobatic display team, the RAF Falcons Parachute Display Team, The Eurofighter Typhoon FGR-4, C130J Hercules and F-18 Hornet. Also flying were a Lockheed P3C Orion, an F-16 Fighting Falcon, PBY Catalina, Voyager KC2, Boeing 727 accompanied by the Blades Aeriel Display team, Avro Vulcan XH558 Chinook HC-4 helicopter, Lynx HMA-8 and a pair of Hughes Apache AH1 helicopters. The Eurofighter Typhoon FGR4 also did a display alongside a Supermarine Spitfire and the finale of the show was a VE Day 70th Anniversary Warbird display of World War Two planes including a Supermarine Spitfire, Hawker Hurricane and Douglas C-47 Dakota. 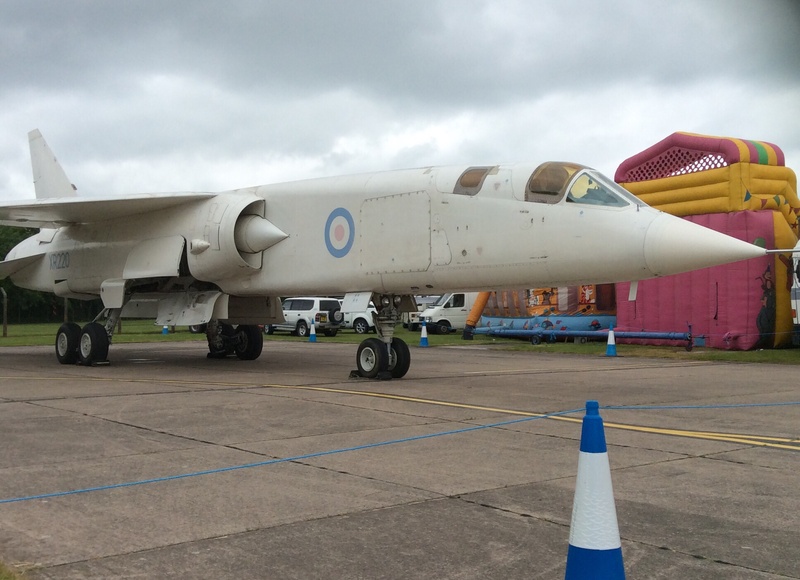 The public also had a rare chance to see what goes on behind the scenes at the base at Cosford. And in addition to the World War II Victory Village There was a huge assortment of interactive ground displays for visitors to enjoy inside the hangars and across the showground. 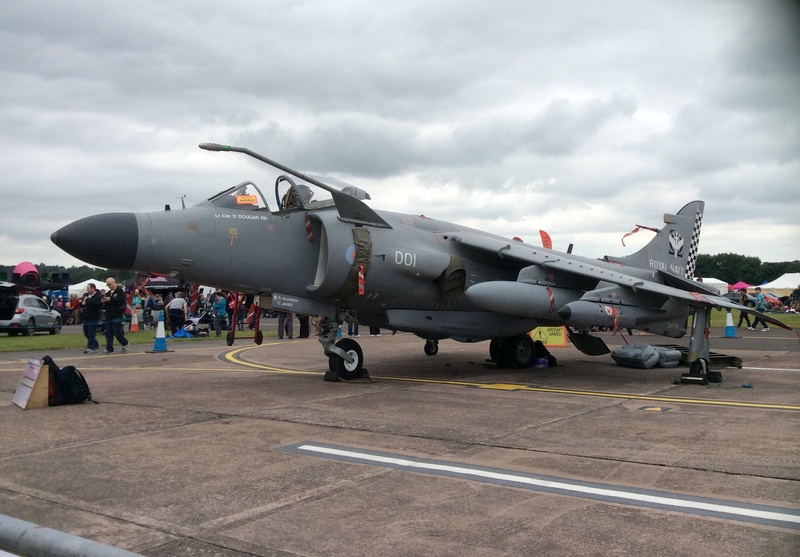 There were also plenty of aircraft on Static Ground display, included a Westland Sea King, Westland Whirlwind, Squirrel Helicopter, SEPECAT Jaguar, Panavia Tornado, Hawker Harrier GR3, Hawker Harrier FRS1, Hughes AH-1 Apache, Harrier ACT and the TSR 2. The SCC Bloodhound supersonic jet and Rocket powered land speed record car, was also on display together with the holder of current World Land-speed record Wing Commander Andy Green and a team of civilian, Aerospace and Army Technicians ahead of their attempt at the World Land speed Record. I have recently watched the Classic six part 1973 Doctor Who episode The Green Death, in which The Doctor (Jon Pertwee) joins Jo Grant(Katy Manning) and The Brigadier (Nicholas Courtney) at U.N.I.T. to investigate a series of unexplained deaths and a strange green glow at a coal mine in South Wales. Their investigation leads to a multi-national petrochemical company named Global Chemicals, Which is run by a Super computer called The Boss, that seems to have a rather sinister hold on the the Managing Director Stephens (Jerome Willis), who is strangely reluctant to co-operate. He informs the Doctor that Global Chemicals are working on a renewable and more powerful energy source to replace Petrol. However he fails to mention that the process is also creating large amounts of hazardous toxic waste as a by-product which Global Chemicals are quietly dumping down a disused mine shaft without telling anyone. Elsewhere dashing young environmentalist Professor Jones has been protesting against the ecological damage and pollution caused by Global Chemicals after finding some rather alarming evidence in the soil. His suspicions are later proved correct when Jo and The Doctor discover that the hazardous toxic waste is having an alarming effect on the insects which are living underground as larvae. To make matters worse Jo and The Doctor find themselves trapped underground with the insect larvae, when the roof caves in on one of the unsafe tunnels which they are investigating and find themselves in mortal peril from giant mutant killer maggots which are gradually making their way to the surface before metamorphosing into very large and highly aggressive adults which could pose a real threat to any humans in the area…. American singer-songwriter and producer Barry Manilow was orn June 17, 1943. He is best known for such recordings as “Mandy”, “Can’t Smile Without You”, and “Copacabana (At the Copa)”.In 1978, five of his albums were on the best-seller charts simultaneously, a feat equalled only by Herb Alpert, Frank Sinatra, Michael Jackson, Bruce Springsteen and Johnny Mathis. He has recorded a string of Billboard hit singles and multi-platinum albums that have resulted in his being named Radio & Records’ No. 1 adult contemporary artist and winning three straight American Music Awards for favorite pop/rock male artist. Between 1974 and 1983 Manilow had three No. 1 singles and 25 that reached the top 40. Several well-known entertainers have praised Manilow, including Sinatra, who was quoted in the 1970s saying, “He’s next.” In 1988, Bob Dylan stopped Manilow at a party, hugged him and said, “Don’t stop what you’re doing, man. We’re all inspired by you.” As well as producing and arranging albums for other artists, including Bette Midler andDionne Warwick, Manilow has written songs for musicals, films, and commercials. From February 2005 to Dec. 30, 2009, he was the headliner at the Las Vegas Hilton, performing hundreds of shows before ending his relationship with the hotel. Since March 2010, he has headlined at the Paris hotel in Las Vegas. He has sold more than 80 million records worldwide.